I'm trying to organize my house while the three older kids are at school and the baby rests in the afternoon. In fact, my goal is to have our home so well put together that when the winter humdrums arrive and we all start to go a little stir crazy in our small house, my husband will see how MUCH SPACE we really have to live here, and he won't start convincing me that we need to move into a house as big as this one. So, I'm organizing. Really, because it MUST be done. We cannot live like this. I won't live like this. (My husband won't, either!) I'm doing one project at a time. Well, really, I have about 5 or 6 going at any given time, but not only do I not like change, I also don't have a long attention span, and I quickly grow tired of one activity and move onto another for a while. Then I don't ever really get back to the first one, and, well, it's a cycle, guys. I'm just saying. 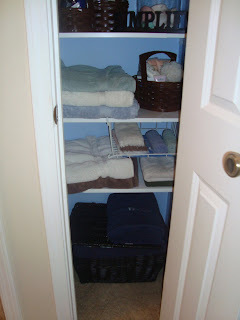 So, here's my hall linen closet. It's really the ONLY closet, but we'll call it the linen closet just for fun. And because I got waaay carried away before I realized what I was doing, just imagine (I know it's hard to imagine SUCH clutter, but try) a whole load of towels SHOVED into that middle space before I stopped and shot the photo. Again, YES I AM EMBARRASSED TO SHOW YOU THIS. But I INSIST upon keepin' it real, Folks! I had to shoot it with flash because it's just such a small, dark space. But, just imagine a pretty pale blue on the walls (vs. the ELECTRIC blue you see here). I used a power drill, Baby. I'm feeling pretty good about this one. And I promise to keep it simple. Forever. Amen.